Introduction: Peg shaped lateral incisors and hypodontiacan compound to difficulty in orthodontic treatment in terms of space management and aesthetics. 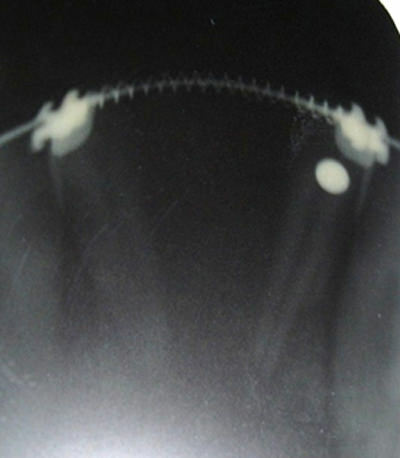 This case report demonstrates the management of such a case with the help of a modified T-shaped Implant. Materials and method: A 16 year old female presented with a class I malocclusion, Peg shaped laterals and partial anodontia in the Mandibular central incisor region. She was treated with a Preadjusted Edgewise appliance ,ceramic crowns and also a T-shaped dental Implant following osteoplasty which was performed to modify the alveolar bone prior to implant placement. Result: The treatment proved to be effective with functional and aesthetic improvement in the patients overall oral health. Conclusion: This case could have been managed in a number of different ways; the authors feel that this was the best treatment plan for this case. Introducción: incisivos laterales en forma de clavija y con hipodoncia dificultan el tratamiento ortodóncico en términos de manejo de espacios y estética. Este caso clínico demuestra el tratamiento con la ayuda de una Implantación de en forma de T (T-shaped) modificado. Materiales y método: Paciente femenino de 16 años presentó una maloclusión clase I, Laterales en forma de clavija y anodoncia parcial en la región de incisivo central Mandibular. Ella fue tratada con aparatos de técnica de arco de canto, coronas de cerámica y también un Implante dental T-shaped después de que fue realizada osteoplastia para modificar el hueso alveolar antes de la colocación del implante. Resultado: el tratamiento resultó ser eficaz con mejora funcional y estética de la paciente la salud en general oral. Conclusión: Este caso podría haber sido manejado de diferentes maneras; los autores consideran que este era el mejor plan de tratamiento para este caso en particular. Peg lateral incisors or Peg shaped lateral Incisors, can be defined as a condition where the Permanent Maxillary lateral incisors are relatively much smaller in proportion to the Maxillary central Incisors. 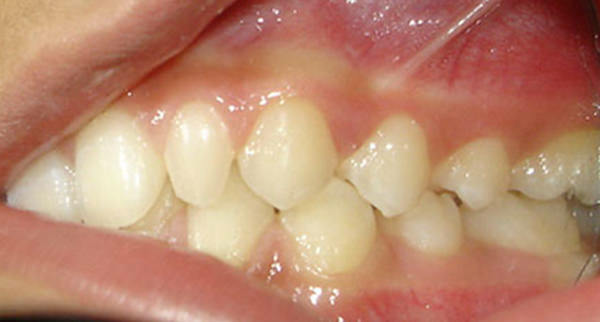 This situation occurs when the permanent lateral incisors do not fully develop. Care must be taken during the diagnosis of peg laterals to rule out the possibility of misdiagnosing over retained deciduous teeth. Apart from Unaesthetic appearance due to the small size of the laterals in the maxillary arch they also cause spacing which may further lead to mesial migration of the posterior teeth causing an alteration in the occlusal pattern and an impairment in mastication. The Peg laterals are a fairly common condition and may be treated in a variety of ways ranging from a crown ( in case of sufficient root support) or a Bridge where the clinical crown and root are malformed and the tooth is extracted . The canines may be substituted for the extracted lateral incisors and reshaped to appear as the lateral incisors. This is called Canine Substitution. 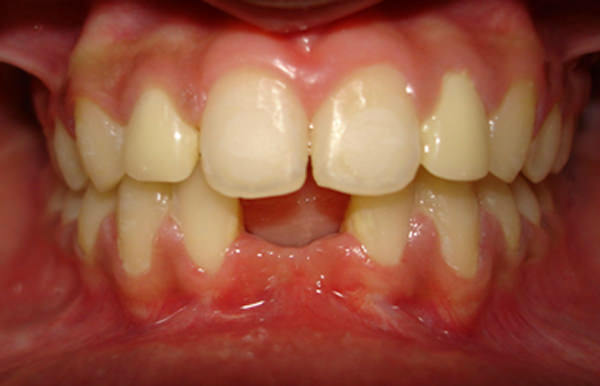 Close to the heels of Peg laterals is a condition of Missing permanent teeth which is called as partial anodontia. This condition is usually treated with fixed or removable prosthesis or in some cases through substitution with an adjacent tooth. This case presented with both peg shaped Maxillary lateral incisors as well as partial anodontia with lower central Incisors and it has been managed with orthodontics, a T-shaped Prosthetic Implant as well as Ceramic Crowns. A 16 year old female patient presented with a class I malocclusion,maxillary peg laterals and hypodontia with respect to her lower central incisors. The patient was treated with a straight wire appliance. Initially a 016" Niti wire was placed for leveling and aligning. The maxillary central incisors were consolidated with a 009" stainless steel ligature wire and an open coil spring was placed between the maxillary central incisors and canines bilaterally to gain sufficient space for the placement of crowns on the lateral incisors. It was observed that the space in the Mandibular arch was insufficient for the replacement with prosthesis for two teeth. Therefore an open coil NiTi spring was placed between the Mandibular lateral incisors to gain sufficient space for a two teeth prosthesis . A 009'' stainless steel ligature wire was used to consolidate the Mandibular teeth from the molars to the lateral incisors bilaterally so as to prevent the relapse of the space gained through the open coil spring. The Crowns have been placed on the peg laterals and sufficient space gained in the Mandibular anterior for placement of Implant. The O16" Niti wires were replaced with 019x025" Niti wires and then 019x025" Stainless steel wires for the expression of Tip and Torque .After space was gained and the teeth were properly aligned , acrylic crowns were placed for the maxillary lateral incisors. 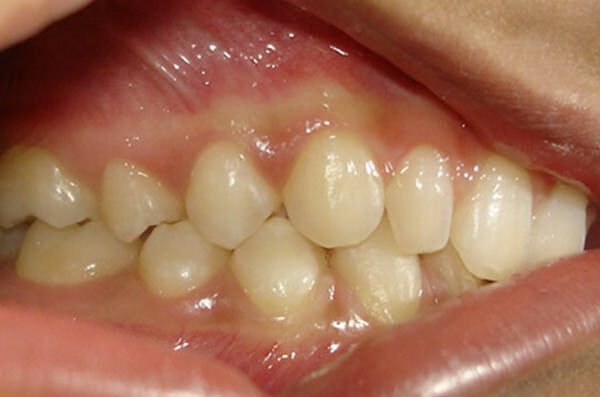 This was done as proper shade matching could not be achieved because of presence of metal brackets on the adjacent teeth . 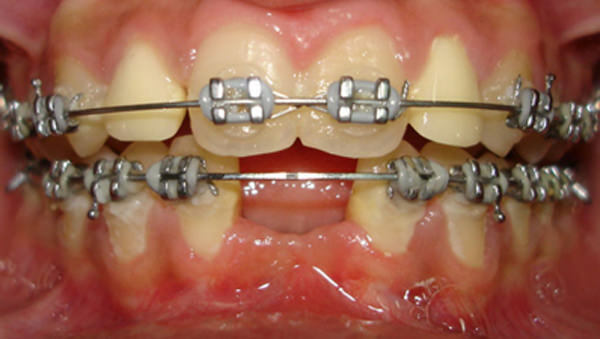 Once the Orthodontic treatment was completed the patient was prepped for an implant replacement for the lower central incisors and in the period of time till the implant was placed an interim removable prosthesis was placed in the lower central incisor area which fulfilled the requirement of a space maintainer as well as restoring the aesthetics. 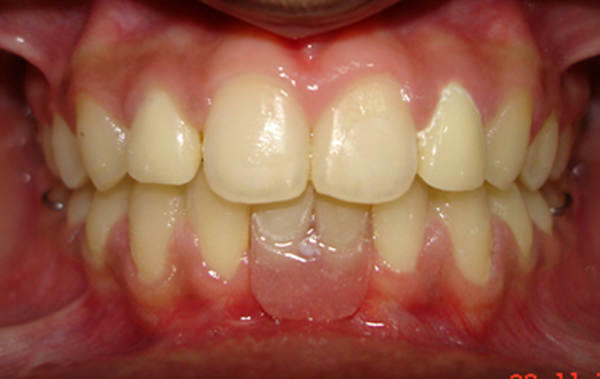 The maxillary lateral incisors acrylic crowns were replaced with ceramic crowns. It was observed that there was insufficient space apically to place two implants to replace the two missing teeth, so it was decided to place one long implant 16 mm in length and 3.3 mm in Diameter ( *High-Tech Implants- Life care company). As the crest of the ridge was narrow ( 3mm ) it was decided to perform osteoplasty of 4mm to achieve a sufficient crestal width ridge to place the implant. The implant was uncovered in a second stage surgery in 4 months and Healing caps were placed for a period of 10 days. As the implant was placed right at the centre of the edentulous space the abutment was split into two from the middle 3rd of the teeth to achieve reasonable aesthetic anatomy in the middle and the incisal 3rd of the prosthesis. The smile line did not reveal more than the incisal 3rd of the tooth, so it did not warrant a bifid custom made abutment. The implant provided functional as well as aesthetic restoration of the patient's oral health. 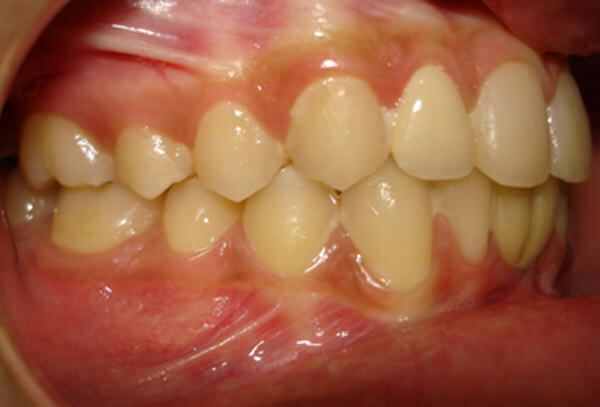 Missing lateral incisors are not very uncommon; however, very few case reports describe the management of missing lower incisors in conjunction with orthodontics and prosthetic implants. 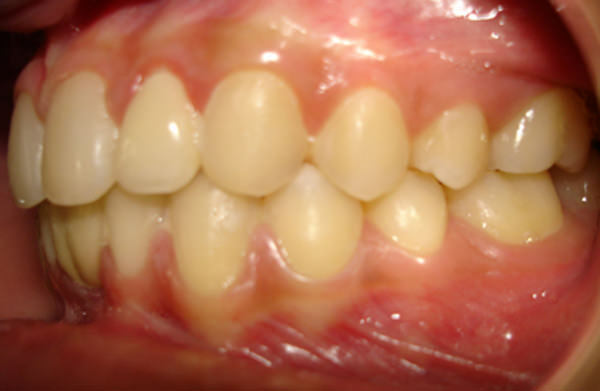 This is a unique case where the patient reported with peg shaped maxillary lateral incisors and missing lower central incisors. 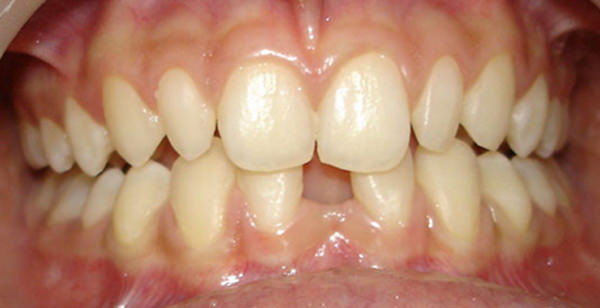 Space was created and crowns were placed on the upper lateral incisors. Although two teeth were missing, due to insufficient bone in the region at the site of implant placement, it was decided to place a single-T-shaped Implant. 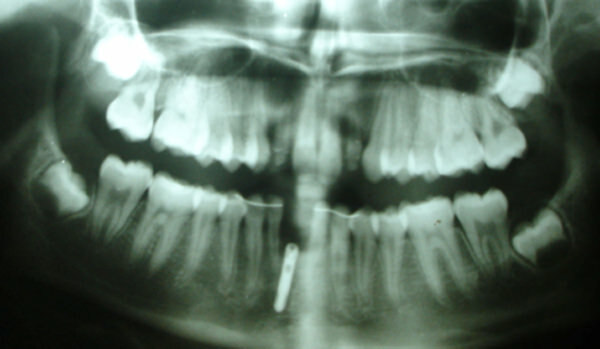 This T-shaped implant would facilitate the replacement of both the missing lower incisors. Under the given circumstances, the authors feel that this was the best treatment plan. Difficulty was encountered because the T-Joint made the crowns appear fused. However, since the cervical portion of the lower incisors is not visible during speech or smiling the patient was satisfied with the outcome of the treatment.